Stone veneer is one of the newest and most popular home improvement trends on the market today. Consider the fact that it both looks great and has an incredible return on investment, and it’s not hard to see why stone veneers have become so popular. Learn everything you need to know about stone veneers in this week’s blog. Stone veneers are basically a stone exterior that is not the true exterior of the home. The veneer is made of real stone, but it’s installed in front of the exterior of the home to make it appear as though the exterior is made of stone. 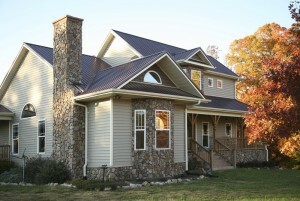 The advantage of this is that you get the look of stone without the expense that would come with a real stone exterior. As homeowners look for alternatives to traditional siding replacement, stone veneer is fast gaining market share. Stone veneer has quickly adopted to a variety of design trends. Whether you’re going for a rustic look, or a chic, modern style, many varieties and colors of stone are available to suit your tastes. Matching veneers on the interior of a home have also caught on recently. This entry was posted on Tuesday, March 31st, 2015	at 5:52 pm	. You can follow any responses to this entry through the RSS 2.0	feed. Both comments and pings are currently closed.